Online shopping for men's clothing and men's accessories can be difficult when you don't know what size you wear. This guide is here to help you find clothes that will fit. You just need a cloth measuring tape, paper, a pencil, and a friend to help. For accurate measurements, make sure to measure over bare skin or your underwear. Once you're finished measuring, check our apparel sizing guides to find the correct sizes. Stand up straight and let your arms hang straight at your sides. Have someone measure the broadest part of your shoulders, over your arms. Keep the measuring tape parallel to the ground. This measurement minus 7 is your jacket size. Stand up straight with your arms hanging straight at your sides. Have someone measure the fullest part of your chest, under your underarms. Keep the measuring tape parallel to the ground. Add an inch to the measurement if you’d like a looser fitting jacket. You can use this measurement as your jacket size, unless the over-arm measurement is larger, in which case, use that number. 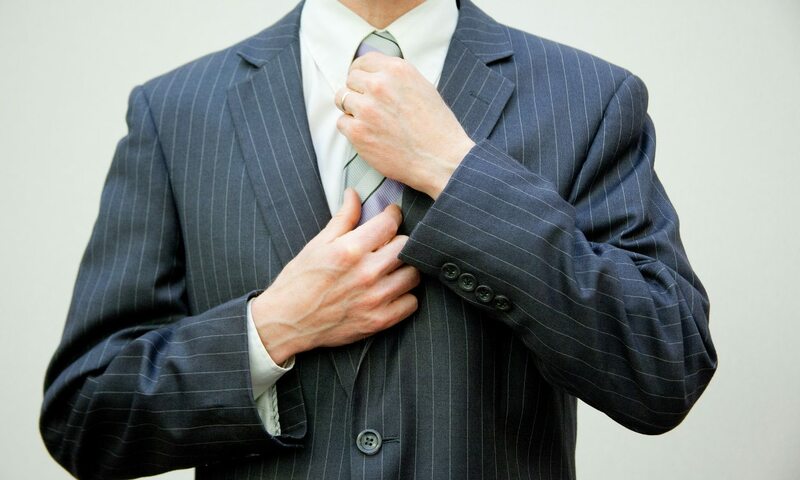 Suit sizes have a number with a letter or word, such as 40L or 40 Long. The letter or word given in the size refers to your overall height. These measurements aren’t hard and fast, though; your body proportions are another factor to consider. For example, if you’re 5’10” but you have a long torso, then you’ll want to shop for a long. The most important thing is that the suit jacket covers your rear end but doesn’t hang much farther. Bend over to one side to find the spot where your waist naturally creases. Measure around your waist at this spot; it should be right under your navel. Keep the measuring tape parallel to the floor and snug against your skin, but don’t pull it tight. This is your waist measurement. Suits have what is called a “drop,” which is the difference between the number given in the size (that you got from your over-arm or chest measurement) and your pant size. American suits typically have a 6-inch drop. For example, an American suit in size 38R would have pants that are size 32. European suits typically have a 7-inch drop, so, you will need to subtract 7 from the over-arm measurement to see what the pant size is. Most men’s dress pants can be let out 1 inch and taken in up to 2 inches, so your body doesn’t need to have the same measurements as the suit; however, you’ll want to choose one that is as close as possible. Suit pants are usually sold unhemmed, so you’ll need to have a tailor hem them to the right length. When they do this, tailors put in a “break.” The break refers to how the bottom edge of your pants hits the top of your shoes. When you have men’s dress pants hemmed, you can also decide if you want a cuff or not. In general, pleated-front pants can be worn with or without cuffs, while flat-front pants should not have cuffs. Full break: The pants are hemmed to reach down to the top of the shoes’ heels, with the front of the hem “breaking” naturally over the shoes. This look is considered very fashionable. Half break: The pants are hemmed to reach about halfway down the back of the shoes. This look is considered classic. No break: If pants have the “no-break” style, the hems end just above the shoes, leaving a bit of sock showing. This look is casual. Measure around your neck just below your Adam’s apple. Add a half-inch to the measurement for comfort. Round off this number to the nearest half-inch. This number is the first part of your dress shirt size. Have someone measure one of your arms, with it hanging straight at your side. Measure from the center back of your neck, over the top of your shoulder, and down to your wrist. This measurement is the second part of the dress shirt size. The chest size and the length of men’s dress shirts varies by brand. You may also see some other descriptions for the shirt, like “slim fit” or “athletic fit.” Take your body shape into consideration when shopping for shirts with these names. Generally, a shirt that has a longer sleeve length with be longer overall. You can also have your men’s dress shirts tailored to fit — as long as the neck and arms already fit you well. Men’s casual shirts uses the same measurements as dress shirts, with more use of U.S. standard clothing sizes. After you’ve taken your measurements, find the corresponding standard size, such as small, medium, or large. Casual men’s pants usually are measured by waist and inseam, and they are already hemmed when you purchase them. To find the inseam, stand up straight with your legs about 6 inches apart. Have someone measure the inside of one leg from the crotch to the bottom of your ankle. Measuring a pair of men’s pants that fit you well can be fairly accurate, too. Belts are meant to fit on your true waist, so you can use the same waist measurement as your pants, by bending to the side, finding the natural crease, and measuring there. A belt fits properly when you can buckle to the second or third hole. Measure the widest part of your head, about an inch above your eyebrows. Hats are often sold in standard sizes (small, medium, large), but you may also see some sold with numerical sizes. These are sometimes called 1/8 sizes because they are written as fractions.